Jan. 22 (UPI) — New England Patriots coach Bill Belichick said Monday he was impressed by the Philadelphia Eagles’ NFC Championship victory. The Patriots coach spoke on a conference a day after beating the Jacksonville Jaguars 24-20 in the AFC Championship in Foxborough, Mass. The typically stoic coach showed rare glimpses of emotion Sunday after the win. He smiled, threw his arms into the air and even hugged players and coaches. The victory punched the Patriots’ ticket to the Super Bowl for back-to-back appearances in the last two seasons. 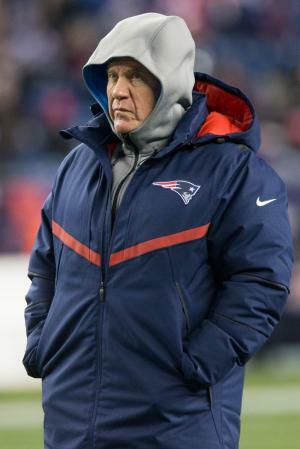 Belichick’s Patriots have earned a trip to the Super Bowl eight times during his 18-year tenure as head coach. New England has hoisted the Lombardi Trophy in five of its seven previous trips. Philadelphia decked the Minnesota Vikings 38-7 in the NFC Championship Sunday at Lincoln Financial Field in Philadelphia. The Eagles did so with backup quarterback Nick Foles. Minnesota had not allowed more than 31 points in a game all season, until facing the Eagles. The Eagles turned to Foles after losing starting quarterback Carson Wentz to a torn ACL during their Week 13 win against the Los Angeles Rams. Philadelphia scored at least 20 points in 12 of Wentz’s 13 starts before the injury. Foles threw four touchdowns in his first start this season for the Eagles on Dec. 17, but the Eagles put up 19 points in Week 15 and were shut out by the Dallas Cowboys in Week 17. Foles did not throw a touchdown in the Eagles’ first playoff victory against the Atlanta Falcons. But he was sharp again on Sunday, completing 26-of-33 passes for 352 yards, three touchdowns and no interceptions. Belichick said he needed a little bit more time when it comes to addressing the Eagles specifically for their Super Bowl matchup. Foles has produced a passer rating of at least 100 in each of his first three career playoff games. That is the longest postseason streak in Eagles history. “We wanted to be aggressive, this is Minnesota, one of the best teams in football, obviously their defense is one of the top defenses in the league,” Foles said after Sunday’s victory.